“ukiyo-e” means ‘the pictures for feeling of excitement’, so never floats but are sinking under the water. The English phrase of ‘f’loating world’ is quite misunderstood and mistranslation. *Uki-yo does not mean “floating” “world”. It means “feeling of excitement” “people and society”. So “ukiyo-e” means exactly “the pictures for feeling of excitement”, not “floating world”. Ukiyo-e never floats but sinks under the water. Mr. SAKAI_toukichi, teisuke and senzaburou had held 65 ukiyo-e exhibition around the world since 1960. Since 1960, JUM had many ukiyo-e exhibition abroad, more than 60 times. 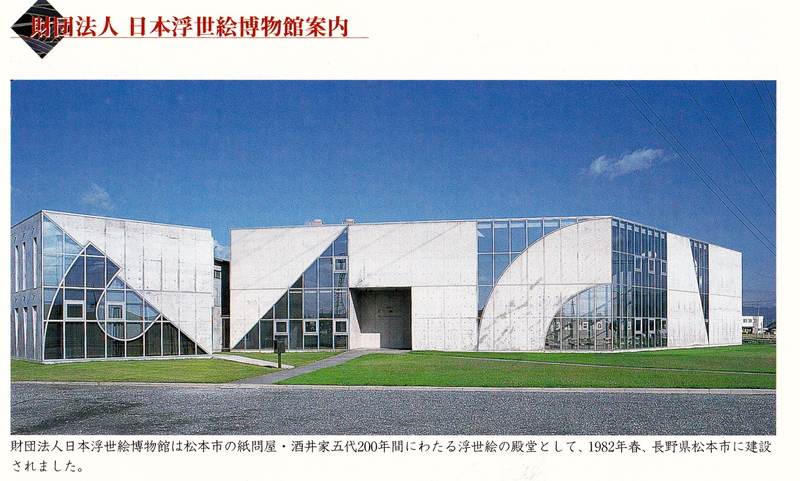 ukiyo-e museum in Matsumoto, Nagano Prefecture in Spring 1982.
and South America and have been received with enthusiasm and admiration of people worldwide, not mention experts and scholars. Through ukiyo-e (Japanese color woodblock prints) JUM is promoting international friendship and mutual understanding and world peace. *Please contact to Mr. SAKAI_kohji, CEO of JUM. 浮世絵学*6／Mr.SAKAI_toukichi and his brothers had 65 world ukiyo-e exhibitions. Copyright (C) 2011-2019 浮世絵・酒井好古堂 Sakai Kohkodou Gallery All Rights Reserved.